Melt butter in a medium skillet over medium heat and add leek. Sauté until leek is soft and tender, about 5-8 minutes. Add shrimp to skillet and cook for 2-3 minutes (add a bit of water if the pan gets too dry). Remove from heat and set aside. Bring a large pot of water to a boil. Once boiling, salt generously (a handful), and cook pasta until al dente, according to time listed on package. 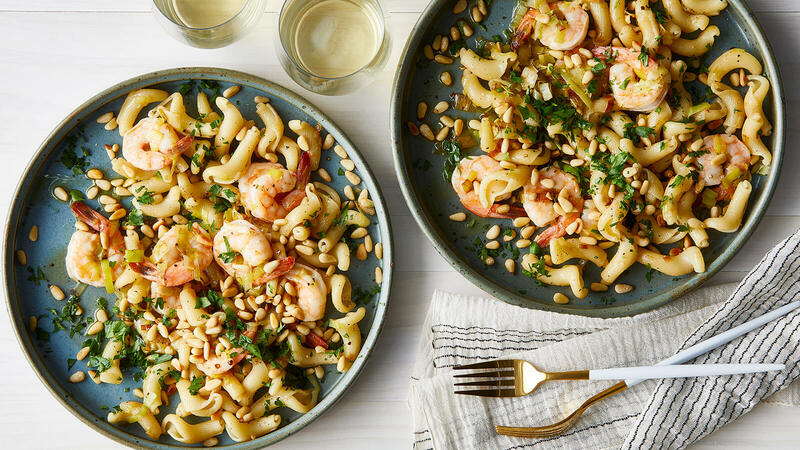 While pasta is cooking, in a small, nonstick skillet over medium low heat, toast the pine nuts until golden brown and fragrant, stirring occasionally, about 3 minutes (watch carefully so they don’t burn). Once pasta is finished cooking, drain and add to skillet with the leeks and shrimp. Toss everything to incorporate. Add pine nuts and salt and pepper, and garnish with parsley and a drizzle of olive oil. Serve immediately.